Wood privacy fences are our specialty, and all of our wood fences are custom stick built (meaning no pre-built panels). Building our fences this way allows for the use of full-size custom materials, not the cheap thin-walled material found in most pre-built panels. Another advantage to stick built wood fences is the ability to roll with any type of terrain without the method of “stair-stepping” that leaves a gap at the bottom corner of each panel as that panel tries to traverse a slope. 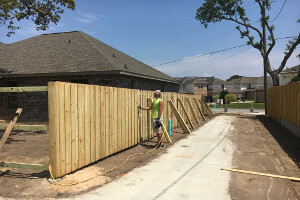 Privacy fences are generally a minimum of 6 ft in height and can be custom built to 8 ft or 10 ft in both the stockade (boards are side by side) or board-on-board (boards overlap for no daylight) versions. The applications for wood privacy fencing can be multipurpose, visually blocking the view from the outside in or the inside out and for containment. Are you a good neighbor? Do you want to be? If so, consider a wood shadowbox fence. The general rule for fencing your backyard is to turn the finished side (or "good side," as some call it) to the neighbor. When constructing most wood fences, the completed project presents two distinct sides. One is the framework and the other is the finished side. At All American Industries, we stick build our wood fences, meaning no pre-built panels. In constructing our fences this way, we have a great deal of flexibility as to the styles we are able to offer. As with all our custom wood fences, we offer the shadowbox in a variety of unique styles: the Straight Dog Ear, the Scallop, and the Saddle cuts and a mixture of different size and style posts such as French Gothic, Dado, and Pointed Dado. Also available are three different species of wood: pressure treated pine, cypress, and Western red cedar. Whatever your choice may be, you can trust the experts at All American Industries for all your fencing needs. With nearly two decades of experience and our promise to deliver the best work in the area, we can guarantee high-quality fencing construction work.